All other machines are behind the Partners firewall and cannot be logged into from outside of the center. If you need to use a computer system that is behind the firewall, SSH into one of the above externally accessible computers and then SSH to the in-center computer to which you need access. Linux and OSX come with a command line 'ssh' client standard. Be careful to specify your user name when connecting. For Windows, you will need to install an SSH client. We suggest that you install the excellent and free SSH client PuTTY. If you have OS9, you can find NiftyTelnet or MacSSH. Windows -- WinSCP or FileZilla. We recommend WinSCP. If you use FileZilla, make sure to enable SFTP in the Site Manager as the default is regular FTP which will fail (see screenshot). Mac OS9 -- MacSFTP, which is shareware but can be downloaded and used for free by Harvard faculty/students from the Harvard IS website). Mac OSX -- The command line 'rsync', 'scp' and 'sftp' utilities are standard. We suggest using rsync as it will copy over only what hasn't been copied already if it gets interrupted and you restart it. If you want a file transfer GUI for OSX, we suggest Fugu. Linux -- The command line 'rsync', 'scp' and 'sftp' utilities are standard. The GNOME and KDE desktops also usually have GUI programs that can do SFTP. Please note that for the gFTP tool, you need to go into File -> Options and on the SSH tab remove anything in the 'Extra Params' textfield and check 'Use SSH2 SFTP subsys'. Also go to the Network tab and make the default protocol SSH2. GUI application like WinSCP or Fugu that use mouse click navigation will not be able to navigate to the /space or /homes or /cluster directories as these are automount points and not user listable. The directories underneath them only appear on explicit use. Therefore the only way to get to directories underneath them is to open the dialog in the application that lets you type in the full path by hand of where to navigate to. Here is an example of this using WinSCP. File transfers are not permitted from gate or entry. When you need to exchange a files with collaborators who do not have Martinos Center accounts, the solution is to use the FileDrop application. This application lets you upload the attachments to a secure website and it will send an email to all email addresses of your choice telling them how to access them. Go to the Martinos Center Email Server website and select the "FileDrop" link. FileDrop is limited to a few 100MBs. If you have larger files, you will need to use the Partners Research Computing Secure File Transfer & Collabortion Site. The tools there handle amounts up to 100GB. If you have an extremely large amount of data you would like to make available to remote collaborators that is under a /space/... or /cluster/... volume we can make select directories there directly available over a password protected website URL. It will be up to you to safely get the password to your collaborators. Contact the IT Support Group with the path of the directory you want to be website accessible. Normally your SSH login will be text-only. You will not be able to run graphical-based programs such as Freesurfer or Matlab in GUI-mode. Most SSH clients support tunneling of X Window traffic over the secure SSH connection if your remote machine is running an X server. If your remote machine is a Linux box, it almost certainly is running an X server. If you give ssh the '-X' option when you connect to one of our SSH servers, the X window traffic of the GUI-based programs you run like Freesurfer will be tunneled and will run. On an OSX box, if you install "Apple X11", you will also have a X server. In the later case you must first run "Apple X11" and execute your ssh connection from one of the xterm windows of that program (not Terminal). Note that graphics requires that very large amounts of information be transferred over the Internet, possibly making the response very slow or, in some cases, impossible. A fast Internet connection is necessary. A 56.6KB modem connection from your home to the Martinos Center is not fast enough. A cable/DSL connection is probably okay for simple GUI jobs, but not anything graphic intensive. In such cases, it is usually better to use VNC even on a Linux or OSX box with an X server. NOTE: We suggest all users use NoMachine Enterprise Client described above for remote connections now. VNC (Virtual Network Computing) is a protocol for accessing the displays of remote computers. A VNC server runs on the remote computer (like a web server) and you use a VNC viewer (like a web browser) on your local box to connected to it and interact with the remote display. ALERT! Notice I have reversed the logic of "remote" and "local" compared to the ssh discussion above! To avoid this confusion I will use "Martinos" and "home" instead in the further discussion. Realize that "home" can mean any computer outside the Martinos center including PCs at MIT or Tufts, or your laptop in Starbucks. To use VNC for remote GUI connections you will need an ssh client as discussed above and a vncviewer program. For Windows, I suggest you install UltraVNC. For OSX, there is Chicken of the VNC (which is the best we have found so far but still quite buggy). Most Linux distributions come with VNC software standard. 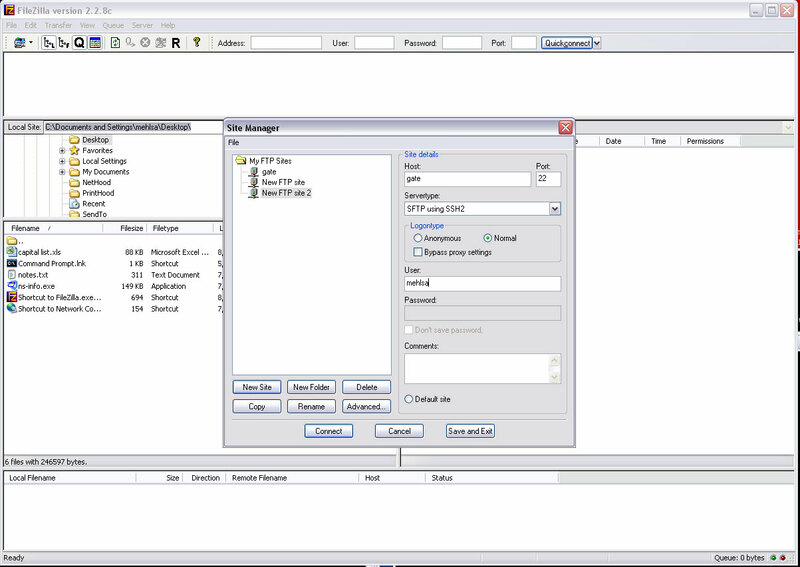 The Partners firewall prevents your VNC viewer at home or on the road from connecting directly to any VNC server you have running at the Martinos Center. To do VNC through the firewall, you will have to use an ssh tunnel. You may want to read this page first which shows the below steps with screenshots. Pay attention to the VNC number given back which has a format like hostname:X (e.g. anago:3). Please DO NOT run vncserver on gate or entry. The vncpasswd program is something you only need to run once or when you want to change your password for accessing the server. This password IS NOT IN SYNC with your normal Martinos account password. You can use the same password as yoru Martinos account, but changing one does not change the other. When you need to run the vncserver program again is a little more complex. Think of running vncserver as booting up a computer. Then running vncviewer (discussed below) is like turning on your monitor. If your computer is already booted, you don't have to reboot it every time you sit down and turn on your monitor. You only have to reboot your computer if you find it off or crashed when you sit down. This is the same as with the vncserver. It is a program that runs on your Linux desktop at the center and STAYS RUNNING till you (a) explicitly kill it, (b) you reboot your Linux desktop (which kills anything running on it), or (c) it crashes. I have written a script, 'vnccheck', that can be run on a machine that will list any VNC servers you already have running on that machine. The name of the program running will not be vncserver (which is just a wrapper script) but will be called Xvnc. If you run 'vnccheck' and nothing is listed, you need to run vncserver again. For PuTTY, before making the connection to gate or entry, go into the config options to make a tunnel from the the port 590X on your home box to port 590X on your Martinos desktop box. On the initial connection dialog, look at the list in the left panel and select Tunnels. Go to Add new forwarded port. Enter "590X" as the Source Port. Enter "desktop:590X" as the Destination. Then click the Add button. Go back to the Session config and make the connection to gate or entry. After connecting, you must leave this second ssh session running. There is no problem in using the session to do other things like run pine. The first ssh connection you made can be ended without a problem. to restart it where X is the display number you already tunneled via ssh. This should work unless some other user has taken that display number. On Windows, start the UltraVNC viewer and connect to "localhost:X". Similarly on OSX for Chicken of VNC connect to host 'localhost' and display 'X'. If everything connects okay, you should be asked for the VNC password. If it does not, either the server is not running or the tunnel is not setup correctly (or at all -- I often forget to hit the Add button in PuTTY when setting up the tunnel). IMPORTANT: At your normal linux desktop, make sure you have chosen a plain desktop background. Fancy picture backgrounds will greatly extend the redraw time of VNC. Many useful websites inside Partners are internal-only access. On example is http://helpdesk.partners.org. One way to access them is to use VNC as described above. You then run a web browser in your VNC session which will be running on an internal machine and thus have access to the websites. Where <username> is your NMR username. Windows PuTTY users should make a tunnel with "8080" as the Source Port and "proxy:80" as the Destination. Remember to click the Add button. Next you have to figure out how to make "localhost:8080" your proxy for the http and SSL protocols. Look in your browser's Preferences for something like Connection Settings. BEWARE! Once you give your browser this proxy, it will use it for all connections, not just to Partners websites. You should use this only while you need it and then remove the proxy settings immediately after you are done. The QuickProxy Extension for Firefox will give you a one-click way of switching on and off the proxy. Or use the highly configurable FoxyProxy which lets you use the proxy only on addresses that match set patterns like http*partners.org*. If you later find your browser is "broke" and cannot load any websites, go check the proxy settings and remove it if it is defined. On the latest Firefox, the proxy settings are found under Tools -> Options -> Advanced -> Network -> Connection -> Settings. If you have a Partners user account, you can apply to use the Partners VPN which will virtually put your home desktop or laptop inside the Partners firewall. Please see the details here.